But what about getting up close… I’m talking within actual photographic range of these fantastic creatures… as they roam free in their natural habitat? 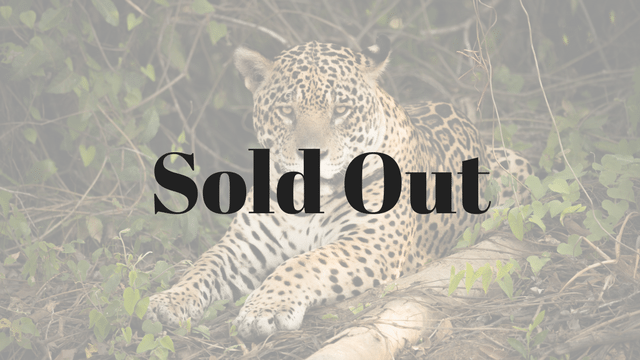 Jaguars by day… ocelots by night… welcome to the world’s largest wetlands! We’ve planned this adventure for November when it’s nearing the end of the dry season in the Pantanal. The Pantanal jaguar is the largest of its own species—and the third largest big cat to roam the earth today. These guys can be as much as 9 feet in length—and weigh more than 200 pounds. The brown capuchin and black-tailed marmoset… giant river otter… yellow anaconda… marsh deer… and giant anteater are just some of the photogenic species native to the Pantanal… not to mention more than 400 species of birds (including great egrets, harpy eagles, tiger herons, guira cuckoos, woodpeckers, toucans, and king vultures). Professional photographer Joe Sindorf will be your instructor for these seven days. Not only will he show you the ropes of a travel photographer’s life, but he’ll also share his insights into capturing the heart and soul of this natural wonderland. Joe Sindorf is an award-winning photographer and international humanitarian filmmaker who has worked in more than 75 nations of the world. His work normally takes him to places where people are at their worst—in the aftermath of major natural disasters; surviving famine or drought; and suffering intense injustice. His still photographs have been published in National Geographic Traveler, Outside, American Photo, World and Professional Photographer among others. His video work has won international film festivals, the NATAS Emmy Award, the George Foster Peabody Award (commonly referred to as the Pulitzer Prize for Television) and others. Joe has led multiple GEP photo expeditions and our guests always comment on his good humor, kindness, knowledge and ability to share his skills with others. Beginners are welcome on this tour—even if you’re just starting to learn your camera. Eight days of full immersion—back-to-back instruction—is exactly what you need to learn your gear and understand the basics of photography. That or “level up” from whatever skills you have today to the next step. Even if the next step is simply learning the difference between a good photograph and a saleable one. Also on this trip will be our own Bonnie Caton. You may know Bonnie as founder and chief of our Breakfast Stock Club. Today, in addition to her full-time job here at Great Escape Publishing, Bonnie makes up to $10,000 a year from her photos. All in her spare time. And, with a local guide who knows all the best spots to catch the local wildlife at their best—you’ll go from photographing the majestic jaguar as he prowls the banks in search of prey… to keeping pace with playful brown capuchins as they swing through the rain forest. Dr. Charles Munn is a legend in ecology and a noted ornithologist, having almost single-handedly saved the gorgeous hyacinth macaw (the largest species of parrot in the world) from extinction. He is an expert in Amazonian birds and jaguars. Beyond his noteworthy work in Brazil, he is credited with being responsible for the protection of millions of acres of reserves and national parks in the Peruvian, Bolivian, and Ecuadorian Amazon. We’re lucky to have him by our side each step of the trip! High activity. You’ll travel by photo boat for most of the expedition, so you’ll need to be able to board and disembark the boat by yourself from the dock several times a day. If you have questions about physical limitations, please contact us before registering. On this expedition you can expect activity-packed days with very little down time to rest. We’ll have early morning and late evening photo shoots. Much of the daytime will be spent either out and about on excursions by car or by boat, or back at our hotel in photo review or class sessions. Be prepared to be on the go for all 7 days! Your expedition starts in the afternoon of Friday, November 8 so you’ll want to arrive in Cuiabá (CGB) that morning at the absolute latest. To break up your trip and allow you to be more rested when we begin our adventure, you may want to fly in a day early (depart the U.S. on November 6, fly overnight and arrive in Brazil November 7) and spend a night in Cuiabá and rest up in one of nice hotels in the city (we have recommendations for you upon registration and can help with your reservation). This extra night is not included in your workshop fee, but it’s highly recommended. Arrive in Cuiabá (CGB), the gateway city for jaguars in Pantanal—a less than three-hour flight (from any of the three primary airports above). From there, we’ll meet with our local guide and drive three hours into the Pantanal to SouthWild Pantanal Lodge, stopping along the way to see the abundant wildlife on Transpantaneira Road. We’ll arrive at the lodge before dark. After some time to relax over dinner, we’ll take a night game drive in a photo safari truck. Most pros, including Joe and Bonnie, do not shoot on full manual. They shoot in a semi-automatic mode like Aperture or Shutter Priority. If you’d like a shooting mode that’s flexible and creative, one of these is likely the best fit for you. Before the tour, we’ll discuss your goals for this trip—and then we’ll work together to make them happen. Beginners can expect to see a very big difference in their photos from Day 1 to Day 8. After breakfast, we’ll spend the day exploring the surroundings of our Pantanal eco-lodge—a 3,800-acre private nature reserve composed of a mosaic of savannas and forests on the banks of the wildlife-rich Pixaim River. Here you can see three species of monkeys and up to 400 bird species—it’s to this lodge that serious birders are drawn (more so than to any other area in the Pantanal). With feeding stations surrounding the gardens to attract birds to the camp, you’ll have plenty of opportunity to photograph feathers of all color. You’ll also have the chance to explore the lodge’s grid of forest trails and use its two observation towers—strategically located at ideal spots: one looking down into a Jabiru Stork nest and another deep in the forest where you’ll see a myriad of birds, along with brown capuchin monkeys and black-tailed marmosets. Along the river is one of the best sites in the world for predictable viewing of wild, endangered giant river otters (sometimes only a few feet away). During the day, it’s possible to spot the occasional jaguar on the riverbank. Come evening at the lodge, you’re likely to spot an ocelot or two. We’ll depart early (after breakfast) for Porto Jofre with stops along Transpantaneira Road to take in the wildlife. Once we reach the end of the road, we’ll take boats eight miles upstream to Jaguar Research Center Reserve—our base for the next six days—where we’ll have lunch before hopping on a boat wildlife excursion. After dinner, we’ll meet for an evening class where Joe will prepare you to get the best out of your camera over the coming days. Over these days, we’ll be based at the Jaguar Research Center Reserve’s “flotel”—where all suites are exclusively reserved for our Brazil Jaguar Photo Expedition guests and instructors. We’ll have the comfort of having the place to ourselves for our regular photo review sessions and meals… all while we get to know each other and learn from each other in an intimate group. Following breakfast each day, we’ll take to the photo boats for our prime mission: the on-river search for the elusive jaguar and endangered giant river otters. Then, we’ll come back to base for lunch… before embarking on an afternoon boat tour. The two boats we’ll use are specifically designed for comfortable photography and stability. As we travel, our boat guides will be in radio contact with spotters along the Three Brothers, Black Channel, Cuiabá and Piquiri rivers, so we can quickly move to any location when a jaguar has been spotted. Following breakfast, we’ll drive to a jungle landing strip to board chartered planes for the 45-minute flight to Cuiabá Airport. From there, connect to your return flight home. *PLEASE NOTE: Itinerary is subject to change. We wish to ensure a trip that will take your photography to a higher level (no matter where you are now), allow you plenty of opportunity to bump up your photo portfolio thanks to our daily wildlife mission trips, and also give you time just to sit back and soak in these amazing surroundings. We’ll continue to be in contact with our local guides in confirming our exact location, day by day—many of which are dependent on the movement of the jaguars. And, we may add in other experiences, e.g. a visit from a local Indian tribe to learn about their culture… a close-up viewing of endangered tapirs… a walking photo tour in the jungle (all of which, should they be added, will be covered in the price of your ticket). When you reserve your spot now, you can lock in your $1,500 discount with a small deposit of just $500 down today. When you do, you lock in the discounted expedition price and you split your fee into eleven easy payments. You can spread them out comfortably over the next few months… and still lock in your $1,500 early registration discount. To register a guest and pay less for the second seat, please call our office at (561) 860-8266. The office is closed after 6 PM on Fridays and does not reopen until 8 AM Monday morning. A photography tour of the world’s largest tropical wetland where you’ll spot and photograph jaguars, ocelots, endangered giant river otters, monkeys, tropical birds, and more. Boat outings—two per day—at a Jaguar research center reserve. Three radio-equipped boats will track and spot wildlife activity for us to photograph. Special activities at a nature reserve on our first night, which include a walk in a scientifically-designed trail system, access to observation towers, and night photography of ocelots at close range. Dinner on your first night, as well as breakfast, lunch, and dinner on days #2 through #8. Breakfast on the morning of your departure. Airport transfers from Cuiabá airport to our lodge in Pantanal.